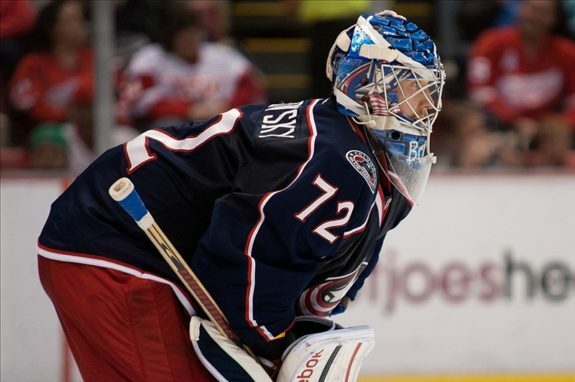 Columbus Blue Jackets: Are They Lucky Or Good? For the 1st time since the beginning of the season, the Columbus Blue Jackets have an over .500 record. Quite an impressive feat that is if you consider that the team went through a stretch of losing 15 of 17 games. The month of December was very kind to the team, as they finished the month with a record of 10-1-1. December was the 3rd time in franchise history that the Blue Jackets finished a month with 10 wins. December also marked the winningest month in franchise history, in terms of points percentage, at .875. This got us to wondering, are the Columbus Blue Jackets this good, or are they more lucky than anything? I mean, you have to be a good team if you win 10 games in a calendar month. At the same time, you must have some lucky bounces go your way too. After studying hours of game tape, the answer to the lucky or good question is, well both. They are very good in some areas, but also very bad in some areas. There is also an element of luck involved. Let’s now look at some key stats to see what the rest of the season might bring. How Are They Over .500? When you take an initial look at the numbers, it would be easy to think that you are looking at a team who is in last place and planning for next year. Just take a look at some of these numbers for the Columbus Blue Jackets to date and where it ranks in the league. 22nd in league in goals/game at 2.53. 26th in league in goals against/game at 3.16. 26th in league in shots/game at 27.5. 27th in league in shots allowed/game at 33.3. 22nd in league in face-offs at 48.3%. 27th in league at 5 on 5 goals for at 58 goals in 38 games. They have given up 83 goals. 29th in league in 3rd period goals allowed, with 49. 18th in league in penalty killing, at 79.9%. These numbers are not good to say the least. But there is more. Check out some of these shot numbers. The Blue Jackets have out shot their opponents in only 11 of 38 games this season. They have a losing record when they do this. They are 5-6 on the season. The Blue Jackets have taken 35 or more shots in a game only 5 times. They’ve allowed 35 or more 17 times. The Blue Jackets have been out shot by 10 or more in a game 11 times this season. The Blue Jackets during their 10-1-1 December eclipsed 30 shots only twice. They went 1-1 in those 2 games. #CBJ has played 38 games. They have outshot their opponent only 11 times. Shots were even once. They have been outshot in 26 games. So you mean to tell me that a team, who is giving up more goals against than for, who is being out shot by 6 shots a game, who can’t win face-offs, who can’t close games, and who can’t achieve 80% penalty killing, is a winning hockey team? Their record sure says otherwise. The Blue Jackets have been able to turn this season around, in spite of what these numbers suggest. There has to be something good going on. The good has to be so good in fact, that it can offset these numbers. There are 2 major factors in play here. #CBJ (amazingly) is 13-10-3 when they are outshot. Without question, this season for the Columbus Blue Jackets has proven just how valuable Sergei Bobrovsky is to them. If there is one thing that can offset bad numbers, it is an elite goaltender. This season, he is 15-10-2, with a 2.75 GAA and a .917 save%. For a team who lost 15 of 17 games, these are remarkable numbers. In fact, the Blue Jackets are 13-10-3 when they are out shot by their opponent. And even more remarkably, the team is 4-5-2 in games when they are out shot by 10 or more in a game. Talk about a goaltender carrying their team. Sergei Bobrovsky is not only the Blue Jackets MVP, he must be considered again for the Vezina this season. Although the Blue Jackets at 5 on 5 has left something to be desired, their power play has surely made up for most of that. They currently sit 3rd in the league at 23.9% on the power play. They are led by the newly resigned Nick Foligno. He has 19 power play points, including 9 power play goals. He trails only the 10 goals of Joe Pavelski for tops in the league. Foligno is also converting at an insane 21.3% of shots. He has been their offensive MVP to this point. This unit must continue at this pace to continue the upward trend. Clearly, injuries had a major impact to the start of the season. But as players have started to return, the team has started to reverse some of these disturbing trends. There are good things going on, but there are things that need fixed. To be able to win given their circumstances is a combination of luck and being good. If the above numbers do not change however, it will be tough for the Blue Jackets to maintain this pace. The 2nd half of the season will be interesting to watch. Can the Blue Jackets continue to beat the odds? As mentally tough as this team is, don’t be surprised if they complete one of the greatest turnarounds in recent memory.